It should go without saying: it’s unlikely that the credit for the invention of Bitcoin goes to a single person. 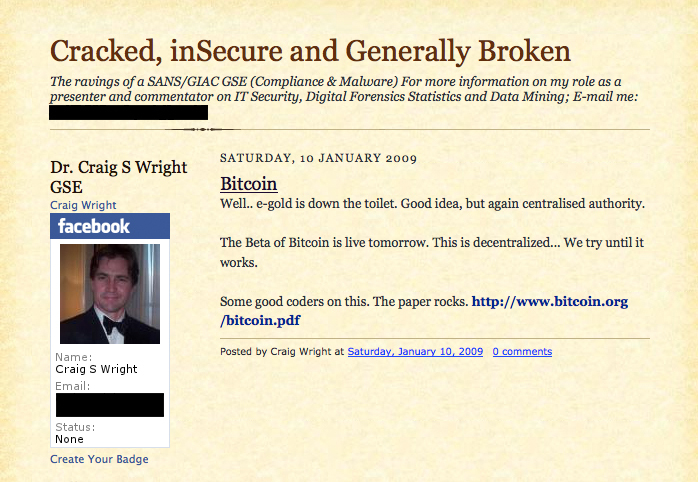 Craig Wright may be Satoshi Nakamoto, but how much of the Blockchain technology is owed to him? We already know, if the investigation brought over by Wired and Gizmodo is based on valid proof, that Craig worked with a team (“some good coders on this”). But was he the one who conceived the blockchain idea? Alternative forms of currency are not a new idea. As Stephen DeMeulenaere, working in the field of Complementary Currency Systems since 1991 and founder of the website ComplementaryCurrency.org explains, Mutual Credit is an old methodology still, that can date at least as back as 1934, when the Swiss bank WIR was founded, and is still in use by issuing currency in Mutual Credit between businesses. Stephen is not a programmer but worked as a Complementary Currency Designer, researcher and promoter and is involved in several projects like Social Trade and the Cyclos payment platform, which pre-dates Bitcoin and won the grand prize at Transact 14. While in the Bitcoin system transactions are not reversible, by design, they are traceable, and implementing a possibility of reversal would be trivial. “In Mutual Credit Systems, because members are giving themselves the right to issue personal currency within a network economy, and in return willing to accept the personal currency created by others, a basic rule is that all members have the right to know the balance and turnover of another member. There was no identity secrecy. Therefore, the transaction ledger is always open and available for anyone to see. Before computers, transactions were handwritten in a ledger book, and anyone could come to the office to see the transactions if they wanted to. This is the same concept as the Blockchain. At one point in time, Stephen was almost entering the underground movement at the very base of the development. “Craig, from what we're reading, held strong Libertarian ideas and wanted to develop a monetary software platform that could achieve those goals. I also see him as a business man that managed to take the parts and put them together in working order. He is clearly a genius, and usually being a genius and good in business don't mix, but he has also achieved that. I think that he does acknowledge others for the realization of Bitcoin. He appears to have had a great deal of foresight and made detailed efforts to obscure his identity, and in doing so, he helped protect others who were also involved. What is very important to be clear about here is that it really was not about the money, in FIAT money terms. It was about introducing a new, decentralized and competitive method of currency issuance. However, I also think that if he patented the system, it would have failed. At the time of the genesis block I don't think he was 100% sure that it would succeed as immensely as it has. The global picture is showing us a group of people that worked for at least two decades in an effort to create a new universal form of currency that would disrupt the existing millenary one, and only with the advent of internet they begun to see a solution to the problem. However, we are surely not stopping to praise Satoshi Nakamoto right out of the blue, we are rather adding another bunch more of valiant people to our room of holy figures.